Archival ready to paint surface. * Belgian linen is ideal for acrylic oil alkyd and tempera. * Mixed media cotton surface accepts watercolor acrylic oil tempera and other aqueous-based media. 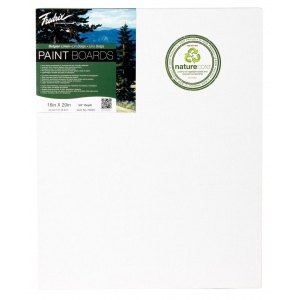 * Lightweight durable easy to transport great for Pleinair. * Pre-primed with acid-free titanium white acrylic gesso. * Made with 100% Nature Core a blend of vegetable based and recycled components.